I'm master of my domain. Some related items at amazon.com; their content is not necessarily endorsed by Dan's Domain Site. Q: What's this site all about, anyway? A: As its title implies, it's about domain names. I aim to give lots of information on this subject, including practical tips on how to obtain and use them, news and information about changes and conflicts involving domain names, and a few rants giving my own opinions about how domain names ought to be handled and how various people are grossly violating this. Q: Why did you decide to create it? A: To give myself a chance to make some more of those opinionated rants, of course! But also to try to be helpful. Actually, I started out by writing sections of my personal website devoted to web tips and politics, each of which ended up having a page regarding domain names: in the web tips section it was to give hints on how to obtain and use domain names for websites, while in the politics section it was to give news and commentary on various ongoing domain name disputes. Finally, I decided the subject was worthy of a website of its own. Then I procrastinated for weeks and months at actually creating this, but finally took the stuff I'd written for the other sites, expanded and rearranged it, and added some more items to yield the first version of this site. Q: Since this site is about domain names, why doesn't it actually have a domain name itself? What's the deal with this domains.dan.info address??? A: Technically, it does have a domain name. It's just a third-level domain beneath dan.info rather than the more common second-level domain beneath com. I did it to make a point, that the domain name system is hierarchical and that there's no need to register loads and loads of separate second-level domains for every last website or marketing gimmick, when the use of subdomains within an existing domain often expresses the nature and structure of the site in a more logical and elegant way. 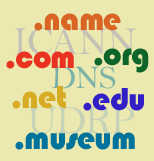 In this case, the name indicates that it's a subsidiary site to my main site at dan.info, devoted to domain names. See my notes on domain name structure for more information. Q: And why is it in a .com domain instead of something else like .org? It doesn't seem commercial to me. And I thought you were such a stickler for those distinctions. A: You must have accessed it by an old link; I'm using domains.dan.info as the main address now, though the domains.dantobias.com address still works too. I originally put it in a dot-com address as a "lesser-of-evils" choice, but have switched it now that other options are available. See more of my comments in the structure section. Q: Who's the "you" and the "me" here, anyway? Aren't you just writing all of these questions and answers yourself? A: Sure, but the "question-and-answer" format seemed to be the best way to communicate my message here, even if it really meant I was having a conversation with myself. Back to the front of the site! This page was first created 14 Mar 2001, and was last modified 26 Aug 2002. Copyright © 2001-2018 by Daniel R. Tobias. All rights reserved.